When you come from a country where the prices always include taxes, tips are banned, prices are expressed in another currency, and your bank will charge additional fee for the transaction, it is very difficult to have an idea of the price to be paid. This is especially true when several taxes apply (some of them also applying to taxes). TTCE aims at quickly providing a raw estimate of the price to pay from the labelled price. It can also retrocompute the tax, tip, change commission and exchange rate level (or retrocompute the price if you are looking for a fair price). 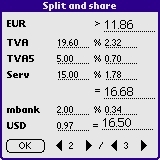 The rates can be stored in a database when they are clearly identified or recorded as the prefered values. Beware: TTCE is provided as is. In particular it is not a financial or scientific calculator. Its purpose is to provide a raw estimate of the result. In no case, these results can be considered exact. TTCE has been designed for being as intuitive as possible (see next paragraph for non intuitive aspects). You can either load it alone to your PalmOS running machine, or load as well the database for some predefined rates. Commission computation: can have (only when entered in the database) a minimum amount that applies per operation. So, under the threshold of this amount the commission is that minimum amount, even if the initial amount is 0. 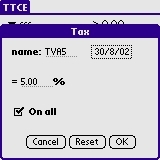 Question mark: in three places in the interface a question mark is raised when TTCE has had to decrease the accuracy of the computations when faced with an overflow (note that in some other places the values are rounded). This should provide a reasonable result anyway. Amounts and percentages are represented as an integer (the number of cents). 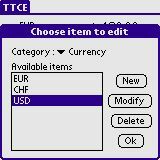 Currency conversion rates must be expressible as x*10^m where x is between 0 and 0x7FFFFFFF and m is between 0 and -11. 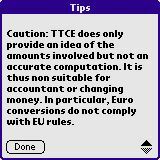 The name TTCE stands for "Tax, tips and currencies in Euro" or "Toutes taxes comprises en Euro" (meaning "all taxes included in Euro"). 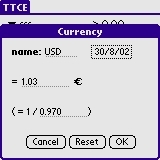 The software "TTCE" described by and downloadable from this web page, hereafter named "the software", is Copyright (C) 1998, 2000-2002, Jérôme Euzenat. 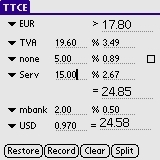 TTCE does only provide an idea of the amounts involved but not an accurate computation. It is thus non suitable for accountant or changing money. In particular, Euro conversions do not comply with EU rules. The previous versions can be downloaded from the history section, they are available in source format with the prc included. TTCE is registred with Palm under the TTCE, and TTCE Desk application under TTDA creator identifier. 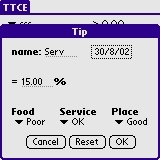 TTCE is freeware. If you like it, drop a mail to freeee À free . fr. If you provide me with a lightweight analyser for this, I implement it right away.